Understanding how gears are formed and how they interact or ‘mesh’ with each other is essential when designing equipment that uses gears or gear trains. The way in which gear teeth are formed and how they mesh is determined by their geometry and kinematics, which is the topic of this book. Gears and Gear Drives provides the reader with comprehensive coverage of gears and gear drives. Spur, helical, bevel, worm and planetary gears are all covered, with consideration given to their classification, geometry, kinematics, accuracy control, load capacity and manufacturing. Cylindrical gear geometry is the basis for dealing with any gear drives, so this is covered in detail. 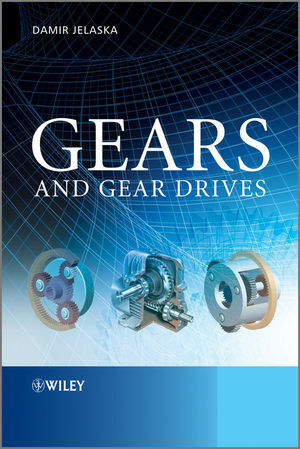 Gears and Gear Drives is a comprehensive reference for gears and gear drive professionals and graduate students in mechanical engineering departments and covers everything important to know how to design, control and manufacture gear drives. Damir Jelaska is currently a professor in the Faculty of Electrical Engineering, Mechanical Engineering and Naval Architecture at University of Split, Croatia. His research interests are in Operational Strength, Mechanical Engineering Design, Integrity of Structures and Components, Fracture Mechanics, and the Reliability and Integrity of Gears. He has written over 50 published journal papers.